Capitalism is locking-in climate change for centuries, but in the process, making radical social change more realistic than tinkering around the edges. It is we who built these palaces and cities, here in Spain and in America and everywhere. We, the workers. We can build others to take their place. And better ones! We are not in the least afraid of ruins. We are going to inherit the earth. There is not the slightest doubt about that. The bourgeoisie might blast and ruin its own world before it leaves the stage of history. We carry a new world here, in our hearts. [...] That world is growing in this minute. Durruti's quote brims with the optimism of a social revolution in full-flow. The insurgent proletariat and peasantry had met an attempted military coup in the streets, and in response launched a profound social revolution. Land and workplaces were seized and reorganised along collectivised lines, moving as fast as possible towards libertarian communism. Three months later, Durruti was dead. The revolution was not far behind. Starved of arms and isolated, the movement stalled. Uneasy collaboration with the republican forces put the revolution on hold. Stalinism and the remnants of the republican state put it into reverse. And with the revolution dead and nothing left to fight for, Franco's forces swept the remnants into prisons and mass graves. Durruti's optimism gave way to fascism, and the unparalleled destruction of the Second World War. Eight years, seven months, and twenty-six days after Durruti's death, the ruins got a lot scarier. The Trinity test, the world's first atomic bomb, exploded with a yield of 20 kilotons in the desert of New Mexico. 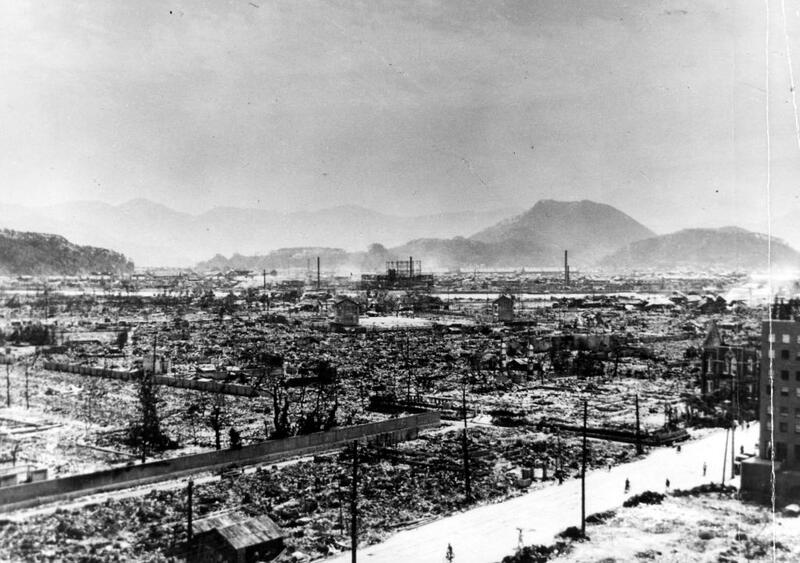 Soon after, the Japanese cities of Hiroshima, then Nagasaki, were reduced to ruins in an instant. The mass destruction of World War II could now be visited on cities in a single warhead. The spectre of mutually assured destruction would dominate the remainder of the twentieth century, as warhead yields grew and delivery mechanisms proliferated, with long-range jet bombers, intercontinental ballistic missiles, and submarine-launched nuclear weapons. Today, we are facing an arguably graver threat. During the Cold War, the inertial logic of realpolitik, with a few near misses, worked towards survival. Mutual destruction was assured in the case of any state launching a nuclear strike. Survival required, in effect, that states did nothing. But with climate change, this logic is reversed. Now, it is inaction which assures mutual destruction. The inertia inherent to the states-system has thus far scuppered all attempts at a binding international emissions reduction framework. The already weak Kyoto Protocol expired without replacement, and the professed goal to agree a new protocol by 2015 looks a lot like kicking the can down the road. This time wasted is time we don't have. The latest report from the Intergovernmental Panel on Climate Change makes use of 'Representative Concentration Pathways'. 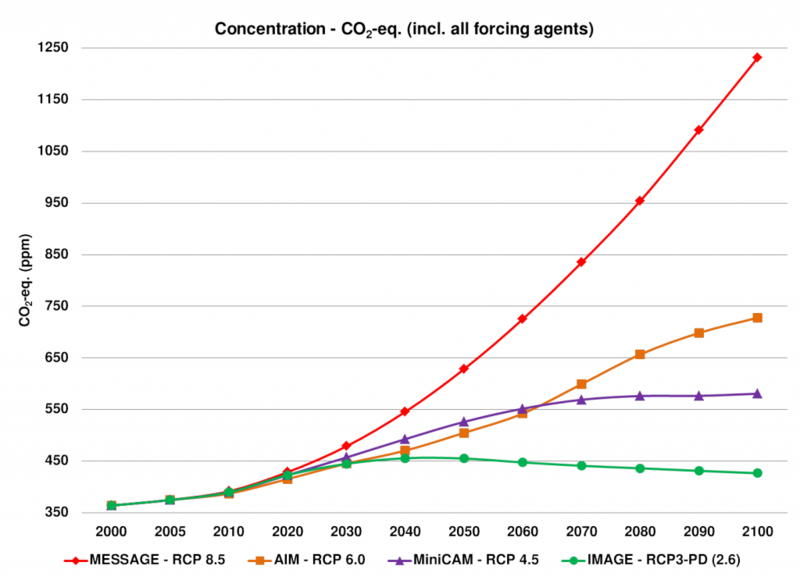 These represent four outcomes for atmospheric greenhouse gas concentrations, and their associated 'radiative forcings' in 2100.1 In the most aggressive of the pathways, RCP-2.6 (also known as RCP-3 PD, for peak and decline), atmospheric greenhouse gas emissions peak in 2020 and decline thereafter (atmospheric concentrations lag behind emissions, so the peaks come later). It is worth noting that RCP-3 PD only gives a 66% chance of avoiding 2 degrees C average global temperature rises (relative to 1750, a.k.a. ‘pre-industrial levels’). 2 degrees C is internationally acknowledged as the 'danger level' above which 'tipping points' are likely to be reached, activating amplifying feedbacks such as ice-albedo, release of methane from warming ocean clathrate deposits, and release of greenhouse gases from thawing permafrost. Once such tipping points are reached, climate change becomes irreversible and self-catalysing. This is commonly called 'runaway climate change'. However some prominent climate scientists, such as James Hansen, believe even this 2 degree target is too high, and reflects more a convenient political sound bite than sound science. The true danger level may be just 1.5 degrees C.
RCP-3 PD is not going to happen, barring immediate, drastic cuts to fossil fuel use. At least 1,199 new coal-fired power plants are currently planned worldwide, which in itself makes a 2020 peak of greenhouse gas emissions impossible. The window for gradual, reformist climate change mitigation may already have closed. The window for revolutionary climate change mitigation is rapidly closing. Rather, to speak of disaster communism is to recognise the Earth we inherit is one where the ice caps are melting, the glaciers are retreating, the sea levels are rising, the oceans are acidifying, food webs are collapsing, the rate of extinctions is growing, storms are getting stronger, flooding is becoming commonplace, and where agriculture will struggle to adapt to changing climate. It's true that there's no such thing as a natural disaster. Capitalism's pursuit of endless growth is driving climate change. But even if it is overthrown, even if that happens soon, we'll be living with the consequences for centuries, or even millennia. That is, if we're living at all. The IPCC's Fourth Assessment Report notes dryly that "unmitigated climate change would, in the long term, be likely to exceed the capacity of natural, managed and human systems to adapt." To speak of disaster communism is to recognise that if communism is to emerge, it will do so in the anthropocene. As capitalism accelerates climate change, ‘possible’ reforms become utopian and ‘impossible’ revolution becomes realistic. We live in strange times. The bourgeoisie is blasting and ruining not just its world, but the Earth systems which sustain human civilisation. We are going to inherit ruins and abandoned cities, there is only the slightest doubt about that. But we still also know how to build, and to build better. 1. Radiative forcing is a measure of the net energy imbalance in the Earth's climate system, measured in Watts per square metre, Wm-2. These can be converted to average global temperatures by relating them to climate sensitivity. See: A glimpse at our possible future climate, best to worst case scenarios. 2. See Aufheben's review of Rebecca Solnit's A paradise built in hell for a discussion of these disaster dynamics. 3. Rapid here means in geological time, when several hundred years is an instant. 4. See this interactive map of approximate sea level rises. As capitalism accelerates climate change, ‘possible’ reforms become utopian and ‘impossible’ revolution becomes realistic. We live in strange times. Wow, you guys are fast! Looking forward to reading this sometime today. We have a few blogs lined up for the launch, but we'll probably settle down into a more regular posting pattern soon. One of the issues people have raised is that climate change can be quite depressing to think about. We're aware of that, and don't want to reinforce despondency with our posts. The first few posts will necessarily be the bleakest, as we are using them to explain the current situation. We'll be posting a few more articles soon on this topic, thinking about how to respond to despair, in terms of utopia, insurrection and hyperobjects. We'll be looking at how to rebuild a habitable planet, and with the idea of disaster communism, we're trying to stress that even the worst case scenarios would be less bad if addressed through self-organisation and mutual aid rather than market mechanisms and state power. "build from the ruins" i my motto for postnihilist praxis, & you guys disaster communism is a concrete example of a properly plitical pragmatics. Looking forward to where you take this! Great article. Looking forward to seeing more.